Alan Turing, aside from being an unsung British hero has also been a spark for cinema. His “Turning Tests” formed the basis of the inspiration and Philosophical throughline of Blade Runner and nearly every film that has had Artificial Intelligence on its mind owes an enormous debt of gratitude to him. With that context, one would think that a film about the man’s life would pale in comparison with his ideas that have permeated film, this assessment it would seem to be half right. The Imitation Game is a strong period piece that works best in its interactions. As well as the showcase of paranoia, melancholily and moral dimensions that emerged out of the work that Turing’s team engage with during the war. However, its Achilles heel is that when it tries to engage or present some of Turing’s ideas. It does them in quite an atypical screenwriting way that it insults them. For example, the screenplay is split between three periods. The first is post-war Britain where Police Officers are investigating a Robbery of Turing’s house, which is suspicious. 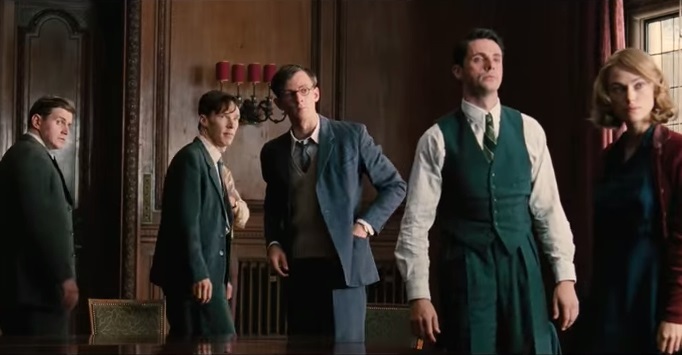 The second is when a young Turing is in prep school and a relationship he has with a boy named Christopher. Finally, the third period is when Turing is working with his team to crack the Enigma machine at Bletchley Park during the Second World War. While the last one mentioned is fine, the first two are interconnected in the sense of finding out about Turing’s homosexuality and the reason he names his machine Christopher. The latter point proves to be rather oversimplistic. Particularly in how it was used in the last moments of the film, showing that the anti-social, no humored Turing just wanted to build the machine as a way of connecting with his dead friend. It seems like a contrivance that is trying to explain psychological insight simply. It truly undercuts some of the ideas presented as well the tragic nature of the final scene, in which we see Turing at his lowest in the midst of his chemical castration sentence. Benedict Cumberbatch’s performance during these finals moments is heartbreaking, subtle and worthy of his Best Acting nomination that he received earlier this month. However, this major problem does not affect the film too much, mostly because the other elements are quite strong. Director Morten Tyldum greatly makes this potential stagy premise tremendously cinematic with a great use of stock footage and montage. They help in making the story feel authentic to its period, tension-filled, as well as drive home the paradoxical nature of the project at Bletchley Park. Additionally the moral weight of some of the actions that occur later on in the picture.